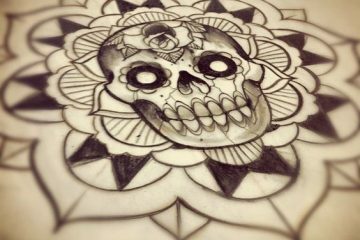 While on the one hand a tattoo can incorporate within it beautiful artwork, the more daring individual goes for something a little more taboo and in one form or another more painful. 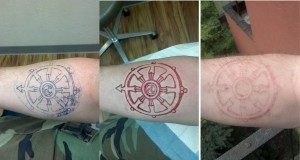 Nowadays, people out there are getting into the art of Body Scarification and Branding. These two, similar yet distinct arts create within them something enchanting and ritualistic. In this article, I shall speak about both, explain how they are done and also give some important tips as for aftercare. Let me start off with Skin Scarification. 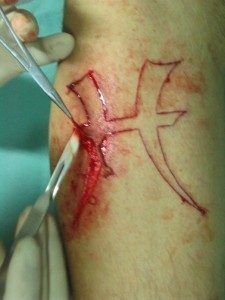 Scarification involves the scratching, etching or superficially cutting designs, pictures or words into the skin as a permanent form of body modification. Scarification is sometimes called Cicatrisation. People around the world have long used their bodies as canvases for the expression of their cultural identity, community status, connection to ancestors as well as to mark their rites of passage or to ‘wear’ a permanent amulet. Having said this, looking a bit at the evolution of scarification, I shall take you back to the Maori. Here, some of the earliest tattoos were cuts with ash rubbed into them, which formed blackened scars. Some of these rituals are known to be also very painful and are sought out to be sacred rites. This process created raised tattoos that made Maori men look fierce in battle and attractive to women. Since no patterns were alike, the facial tattoos also marked identity. In Papua New Guinea’s Sepik region, scarification is an initiation rite for young men. Here, their chest, back and bum are sliced with a bamboo sliver in order to test their strength and self-discipline. The resulting scars would then represent teeth marks of the crocodile that ‘swallowed’ that same young man during the ritual – since for them, it is believed that crocodiles created humans. On the other hand, in Australia, scarring was practiced widely among Aborigines, but is now restricted almost entirely to parts of Arnhem Land in the Northern Territory. Here, cuts are made on the chests, shoulders, and bellies of both men and women. It was found that without these said scars, “clean skin” tribe members were not permitted to trade, sing ceremonial songs, or participate in other tribal activities. Generally, scarification was done on people with darker skin, since a tattoo would not be seen as clearly as a scar would. Nowadays more people are seeking out scarification; it can be thought of as nostalgia for a different type of society. 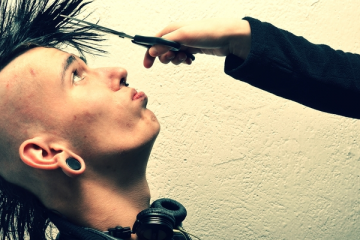 On the other hand, there are others who scarify just to be different – there are also those who argue that body modification is not really so strange within a culture where identity is often expressed through appearance. Having said this, many argue that scarification is not as popular as tattooing, since it still carries a stigma as something really bizarre. Scarification is not a precise practice; variables, such as skin type, cut depth, and how the wound is treated while healing, make the outcome unpredictable. A method that works on one person may not work on another. The scars tend to spread as they heal, so the outcome design is usually simple, the details might be lost during healing. Scarification is commonly done by cutting in single lines along the body in order to produce thin scars and together with this, skin removal is a way in order to get a larger area of scar tissue. Following this, the outlines of the area of the skin to be removed are cut and the skin to be removed will be peeled away. Apart from this method, there are other methods one uses in order to produce finer scars, such as Hatching. Here one uses a sterile surgical scalpel to cut into the skin and a larger area is required to be scarred. This method is easier to perform than flesh removal and can be done with one hand. While this technique can take longer for larger piece, it is useful for smaller, more detailed designs and enables shading to be used. Branding, even though is done in different ways, it is known to be a branch of skin scarification. It does leave a scar, it is just done by burning the skin instead of chopping pieces of skin out, and bleed as a result. 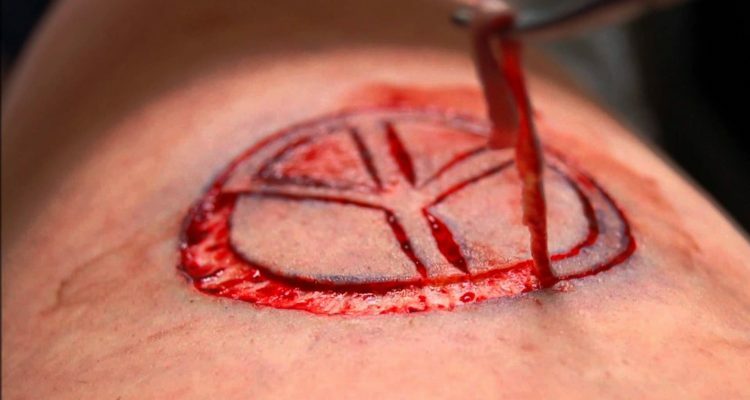 Like scarification, human branding or stigmatizing may be practiced as a rite of passage within certain tribes, or to signify membership to an organisation such as a college sorority or fraternity. Branding involves the process where a mark, usually a symbol or ornamental pattern, is burned into the skin, with the intention that the resulting scar makes it permanent. This is performed using a hot or very cold branding iron. Originally, branding was often used so as to brand cattle – people would know who that particular cow or bull belonged to. This then evolved where slaves used to be branded in order to be recognized by their ‘owner’. It is said that European, American and other colonial slavers branded millions of slaves during the period of trans-Atlantic enslavement. To a slave owner it would be logical to mark such property just like cattle, more so since humans are more able to escape. An example of this is found within the Romans, who used to brand their runaway slaves with the letters FUG (for fugitivus). With regards criminal law, branding with a hot iron was a mode of punishment; this labelled the person as if he or she was a type of good or animal, and as a result there would be a reduction of their status in life. Brand marks have also been used as a punishment for convicted criminals, combining physical punishment, as burns are very painful, with public humiliation. Public humiliations was the more important intention. Robbers, were marked by the Romans with the letter F and the toilers in the mines, and convicts condemned to figure in gladiatorial shows, were branded on the forehead for identification. In the 16th century, German Ana-baptists were branded with a cross on their foreheads for refusing to disclose their faith and join the Roman Catholic church. On the other hand, in the North-American Puritan settlements of the 17th century, men and women sentenced for having committed acts of adultery were branded with an “A” letter on their chests or breasts. As one can see, the history around body branding is the darkest of all the forms of body modification. Brands were used as a mark of ownership over slaves. Hollywood films have helped to enforce this dark image by showing painful, non consensual brands being performed on people, against their will. Having said that, today, body branding is gaining popularity. The risks are great for those who do not know what they are doing. People attempting to do this type of body modification on themselves, are risking very painful and permanent damage to their bodies. Using materials such as bent coat hangers and paperclips to do branding is INCREDIBLY DANGEROUS! Those materials contain plated metals, which can chip off and find themselves in the skin, causing metal poisoning, and potentially a painful surgery to have them removed. NEVER TRY THIS AT HOME!